Journalist Alisa Wylie‘s mental health took a turn for the worse during her time at university after the death of her sister and father. She was able to access counselling, but many find it more difficult to get the help they need from student services. Alisa writes about her experience as part of the Ferret’s Story Lab programme, and interviews six others who needed mental health support during their studies. As “millennials”, we regularly see online think pieces from older generations berating us for not being able to buy houses just because we might treat ourselves to breakfast in a cafe every once in a while. Our generation is one where everything just feels harder. For me, most days are a struggle to get out of bed. Why bother to get up when the world around me is so fractured? We are known as the Instagram generation, for better or worse. Social media connects people, but on the flip side it can make younger people who are already struggling feel even more socially isolated as all they see online are the positive or good things that their friends might be posting on their Facebook, Instagram, and Snapchats. It’s no wonder that in a world where we are ever increasingly plugged into our smartphones that we become dependent – and disillusioned with reality and our own mental battles that we have to face when we take a step back from screens. While I’ve had counselling, I still struggle every day. I can’t imagine myself being in the headspace of someone who has not had support and how they must be feeling. At university in particular, many are away from their family and friend support networks for the first time. During my time accessing mental health counselling services as an undergraduate at Strathclyde, I was seen three times over the course of four years. I sometimes joke that the reason I look so terrible in my student ID card is because the photo was taken after I had left my first talking therapy session. My second session came in second year. It helped me work through a plethora of issues, and I felt my mental health improve massively. Third year was, mostly, better. Fourth year is when I really started to struggle academically. On 26 May 2016, my father was diagnosed with advanced, and terminal, multiple myeloma, a type of bone cancer. I had to return to counselling to help me deal with it. 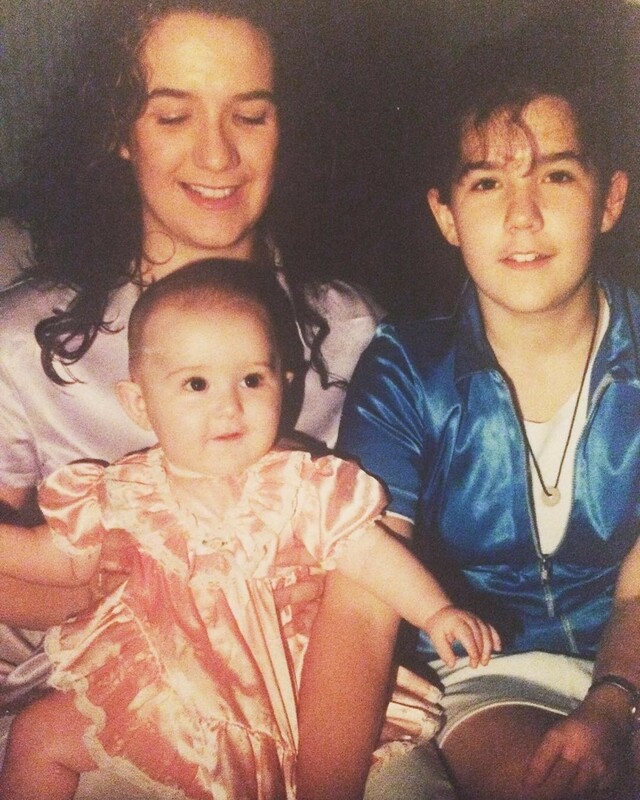 Then, my sister Christina, aged 37, died unexpectedly on 18 January 2017. This was also my dad’s 58th birthday. Looking down at me in the photo below is my sister. She was warm, caring and so special to me. I miss her very, very much. Around this time, my counsellor retired in the middle of ongoing sessions. A new counsellor was brought on board who took on my case and worked with me before and following my dad’s passing. My dad died on 4 August 2017. My new counsellor did not specialise in grief, but she had an interest in it. She arranged for a type of ‘group therapy’ session as a way to try and bring together students she had treated who had been through similar circumstances. It did help, although it was hard to get everyone together at once. I did manage to access counselling services and my experience was generally a positive one. Counselling managed to help me through a lot of awful things that I wouldn’t wish anyone to go through, especially while also going through the pressures of studying for a degree. Back then, I wrote an article about how the student counselling services had helped me for the student newspaper, the Strathclyde Telegraph, where at the time I was Editor-In-Chief. However, I realised that this isn’t always the case for the others, and it did not sit right with me that I was somehow a priority because I had been through a significant loss. For the people I’ve spoken to who had had positive experiences with mental health support services at university, the same sentiment kept cropping up: “I just got lucky”. But should it really take ‘luck’ to receive adequate mental health support while studying at a higher education institution in Scotland? Recent data has shown a huge rise in students in Scotland seeking mental health services, with an increase of two-thirds over the past five years. More than 11,700 students asked for mental health treatment in 2016-17 compared with about 7,000 in 2012-13. I spoke to the National Union of Students. They flagged up research they published last year, showing a 76 per cent rise in students trying to access counselling services, with only 60 per cent of those students going on to receive support. I also asked Scottish universities about their numbers of counsellors, service users and waiting times to access mental health services. Not all this data was provided, or is recorded, but it does show waiting times at several universities of almost a month to access services. A month is a long time if you are struggling. To find out more about what it means to struggle with mental health at university, I spoke to six other students, who shared with me their experiences. Originally from India, Kritika says she has always been a fierce advocate for mental health rights and awareness. She is the curator of Mental Health Mirror – a newsletter that aims to create a dialogue around mental health – and also writes for UnBumf, an online publication that covers different aspects of contemporary Indian culture, including articles about mental health in the country. 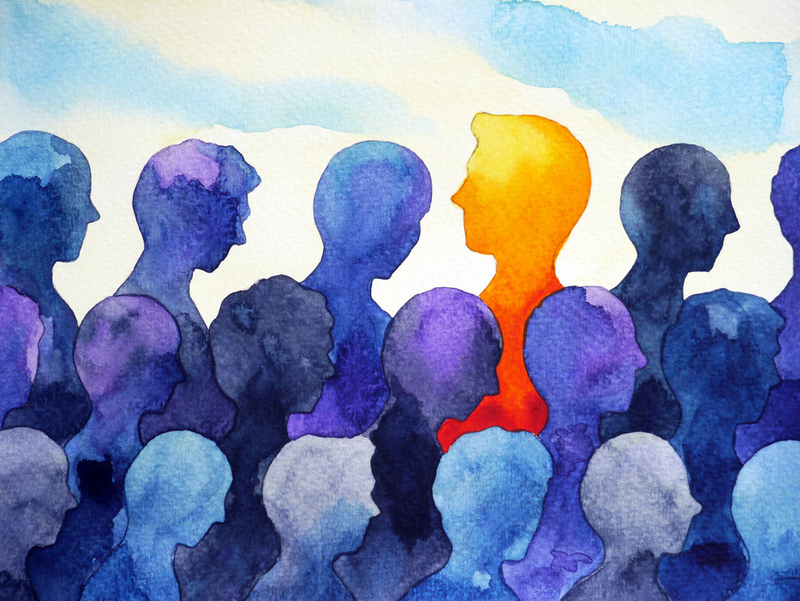 Recently, she wrote about how insurance companies in India will now cover mental health treatment, a breakthrough for the country in terms of its more conservative attitudes towards mental health. Prior to moving to Glasgow to study for her masters degree in Media Management, Kritika had never travelled outwith India. On top of the usual student pressures and her mental health issues, she had the culture shock of being somewhere very unfamiliar, a long way from home. She applied for support and says she had to wait three and a half months to receive the help she needed (the average waiting time in 2016-17 was just over a month). After several unsuccessful drop-in counselling sessions, she counts herself as one of the lucky ones because she was eventually paired with the right counsellor, able to give her the right support – something she says she views as complete chance. A spokesperson from the University of Glasgow told The Ferret: “Student welfare is paramount to the University of Glasgow. We have invested heavily in our mental health provision and last year committed an additional £200,000 in our budget for this and subsequent academic years in Counselling and Psychological Services. “Last year we published a comprehensive Mental Health Action Plan, a joint initiative with the Students’ Representative Council. The University has made clear that we will make more resources available, over and above this amount, to support the implementation of the Mental Health Action Plan if this is required. “At the University of Glasgow we have expanded our general counselling and psychological service but also put emphasis on dealing with the most acute cases. Our Priority Response programme allows for up to eight appointments per day for students in crisis. 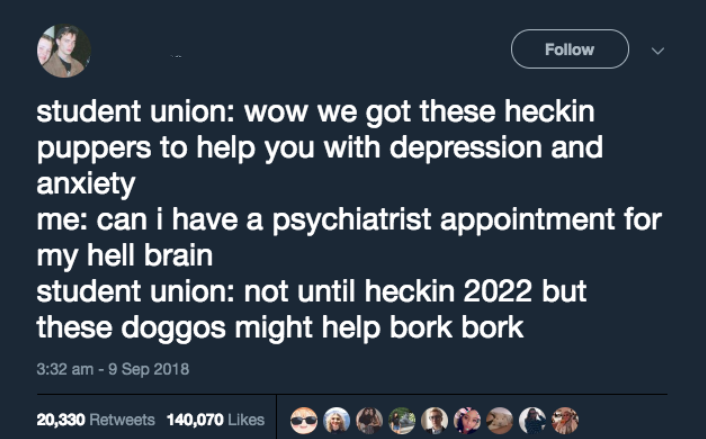 “Students can make these appointments online on the day, or by direct contact with the Counselling and Psychological Services (CaPS) office. We take all individual cases extremely seriously and would encourage any students who are having issues with the process to contact us so that we can do all we can to assist. “In 2017/18 CaPS received its highest ever number of referrals – 2507 students accessed the service. This is an 8% increase on the previous year, and an overall 52% increase over the past five academic years. Kevin was the victim of a violent attack on a night out a couple of years ago, and since then has been dealing with the aftermath of that – post traumatic stress disorder. He has been incredibly open about his experiences, chronicling his journey on his website, Weasel blogs, sharing his personal story for mental health charity See Me Scotland, as well as working as a volunteer with Victim Support Scotland, with whom he has spoken at conferences about his experiences with the criminal justice system following his assault. He has also spoken about how he has in the past dealt with suicidal thoughts, depression and anxiety. As a mature student, studying for a Masters in psychological research methods and child development at the University of Stirling, he said his anxiety worsened, and that he felt like an ‘outsider’ due to his age. He felt that he didn’t need the counselling services that the university provided and was more suited to working with a mental health mentor, Steph, who he began getting help from as an undergrad. However, he says he has heard multiple stories from friends at the University who have had negative experiences with the counselling offered to them. The average waiting time at Stirling in 2016-17 was four weeks. One of his friends, he said, was told to pray, despite not even being religious, as a solution to their problems. 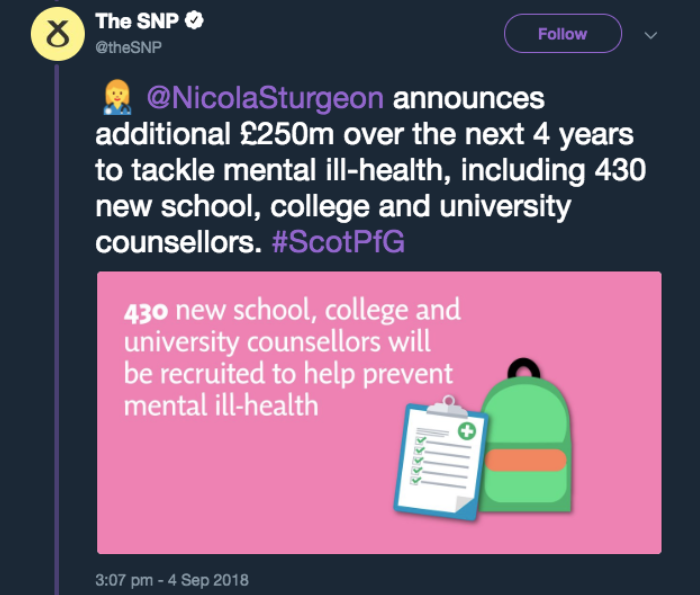 The Scottish Government announced funding for mental health counsellors across the entire education system in late 2018 – will this make a difference? “The main issue was that this was my first attempt at any counselling. To be told that hospitalisation would be the necessary course after one session and without any real trust in the relationship – it knocked my confidence even further and I was hesitant to approach any other counselling for months afterwards.”, says Claire, who wishes to remain anonymous. Claire, who was studying for a Masters in health history at the University of Strathclyde, had a particularly negative experience as, in her words, she was told in her first session that being sectioned would be more appropriate to meet her needs than university counselling. She went to counselling to seek help after several suicide attempts, as well as depression and anxiety issues. She was nervous that her medication wasn’t working, and was dealing with panic attacks stemming from a previous sexual assault. Her assailant also went to the university and she had issues going into certain buildings and attending classes there. She also had to take a break from university to deal with a breakdown, and did not feel that the counsellor even began to build a relationship with her to discuss any of these issues other than asking “how her relationship with her father was”. She is not the only person who has reported negative experiences with these specific counselling services. An anonymous student told me how, following trauma from sexual assault, they were told that the counselling services could not help them and were told to go elsewhere for help. It took her a month to be seen after initially reaching out for support. The university says it does not record waiting times. 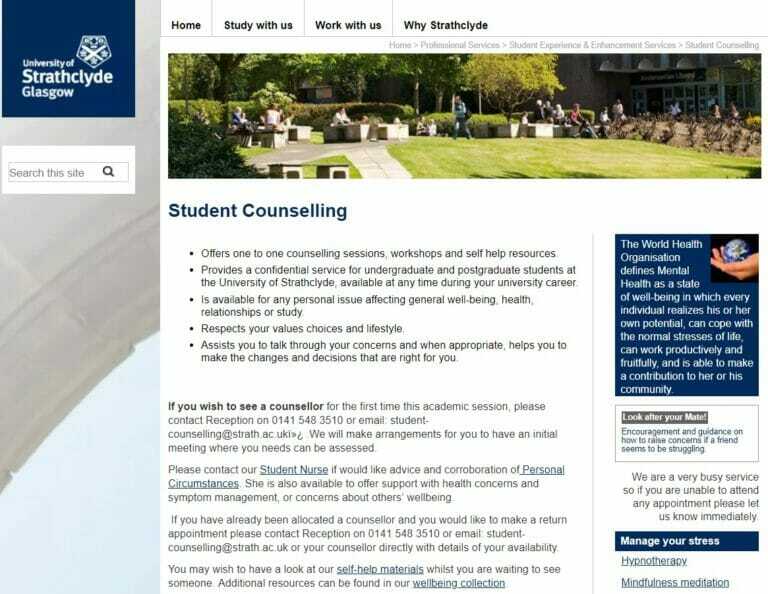 A spokesman for the University of Strathclyde said: “The University of Strathclyde is committed to ensuring the safety and wellbeing of our students and provides a range of services to support this priority. At the time of writing, Lily has just completed her masters degree in Medieval Literature at Edinburgh University. She is a disability activist, and produces informative Twitter threads on that topic, as well as many others. She creates content for her Patreon page, on which she writes short fiction, poetry, non-fiction essays, and educational content. She took a break from her MSc in March 2017, returning in January of the next year. At university, Lily had to wait about a month until her first assessment appointment. Afterwards, there were no subsequent appointments beyond the first assessment as they determined that they could not help her. After a recommendation from a university counsellor, she decided she would have to pay for private counselling. Lily said that she felt that she was “cut loose” by the university mental health support services. She also stated that her university work had always suffered due to poor mental health; however the university’s refusal to help made it worse. The University of Edinburgh is another institution that does not record waiting times, or at least didn’t in 2016-17. “The health and wellbeing of our students is of the utmost priority. In recognition of this, we have more than doubled the budget of our Counselling Service over the last decade. Last year, we invested £995,000 in the service. A further £150,000 has been committed for the new academic year. “As well as increased investment in frontline services, we have stepped up efforts to promote our facilities and raise awareness of mental health issues among students and staff. It is encouraging that more students are coming forward to get the support they need. “We operate a short-term model of counselling of up to five sessions with a trained counsellor. In a small number of cases the counsellor may conclude that counselling is not the right therapy for the individual’s situation or issues and advise them of alternative or more suitable forms of support that are available. “The mental health support provided by the University is intended to supplement and enhance, rather than replace or duplicate, NHS provision. “In addition to one-to-one support, the Counselling Service also offer a wide range of other forms of support including wellbeing workshops, guided self-help and access to online support packages. The Centre is due to open in 2019. Jennifer has written openly about her experiences struggling with mental health while studying towards a doctorate. She did not access counselling through her institution, but as an academic she was offered “mindfulness classes and resources”, which she did not believe to be of use to her particular situation. Through social networking, she was by chance able to source and also qualify for free counselling externally. She says, in her experience, that talk therapy does help. University of the West of Scotland at least sees students relatively quickly – with an average waiting time in 2016-17 of just over one week. Jennifer has discussed her struggles with mental health during her PhD at events, as well as working as a lecturer in universities in both Scotland and England. Discussing matters of care in an academic role, she says that if you work with young people under the age of 25, you do have a responsibility as a “corporate parent” and that often had a strain on her own mental health given that she was already under immense pressure. Jennifer believes that universities act much like “conveyor belts”, in the sense that students are encouraged to push on with their academic work in spite of how it may be affecting their mental health. There is an ideology that exists, she says, within institutions that you are “not allowed to fail”, and says that the administrative aspect to acknowledging student circumstances at times can be poor. She says that student cases should be looked at individually and circumstantially, rather than promoting the ideology that taking a break for your mental wellbeing might somehow equate to a failure. Paul, who was studying commercial music at an undergraduate level, was friends with a student at the University of the West of Scotland who died by suicide, but said that he did not feel close enough with him to merit counselling after his death, unlike those who he felt to be closer who he thought “deserved it more”. He says he felt there was a strain on the mental health support services at that time, therefore he decided to take an alternative route. He ended up paying £60 per session for private counselling. He says that there was further anxiety created by the layout of the student support services, which are open plan, meaning he felt self-conscious trying to seek out support services on campus. In the FOI response that detailed the waiting times for mental health support services, the university noted that “urgent enquiries are prioritised and responded to as soon as a counsellor is available”. These are just a handful of people who have suffered mental health challenges at university. Far from being “snowflakes”, many have shown great strength and determination through difficult, lonely times. I’ve written about grief and loss, and struggling to deal with them while living the new, transitional, sometimes demanding life of a student. I’ve written about heartbreak, literal and metaphorical. I’ve written about not always knowing if I can go on. But hope is always there, always present, hidden somewhere in the corners or the gaps or the flickers of the sun. In the meantime, it’s critical that universities, and colleges too, put measures in place to ensure that students facing mental health challenges get effective and timely support when they need it – it’s their responsibility as they are the bridge between students’ home lives and their futures. Saying “it’s good to talk” is no longer good enough. I used to work (in the later 1990s – finished in 1999, I think), as a Psychologist, in the Student Health Service (as it then was…) at the University of Aberdeen. It was the busiest role I have ever worked in; but one I also found very rewarding, personally. I have no idea what is happening there now (NB I studied your chart on this – and thought the resources didn’t look too good); but I do hope the requirement is taken seriously enough by the University, and the current service providers.